The IMAGINE multimedia spectacular held at Dubai Festival City, a growing resort and leisure precinct near Dubai International Airport, received two Guinness World Records for World’s Biggest Water Screen and World’s Largest Permanent Projection Mapping, both created using Panasonic PT-DZ21K2 projectors from Panasonic in collaboration with Al-Futtaim Panatech and the show’s creator, Laservision. In 2016, Dubai Festival City (DFC) sought to create vast, groundbreaking visuals around the bayside precinct, enhancing the possibilities for event staging. 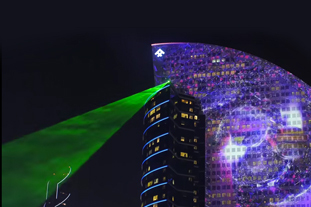 Panasonic and Al-Futtaim Panatech were chosen to provide more than 60 flagship PT-DZ21K2 20,000-lumen quad-lamp projectors to create dynamic mega-screen images onto the facade of the InterContinental Dubai Festival City hotel. A further 12 PT-DZ21K2 projectors were deployed for the water-screen installation, creating a seamless 68-meter-wide by 13-meter-high screen for multimedia projected onto misted water from fountains. 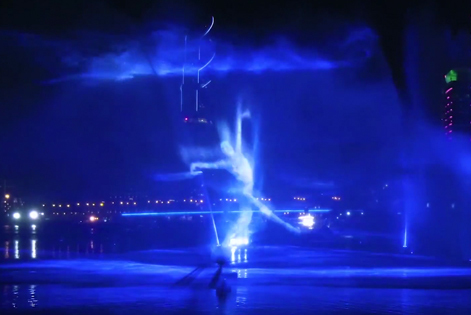 Guinness World Records verified the water-screen projection as World’s Biggest in early 2017, and the show as World’s Largest Permanent Projection Mapping in May 2017. These achievements add to a growing list of records set by the Panasonic PT-DZ21K2 projector over the last 12 months. While illuminating water is nothing new, projecting moving images onto fine mists is a challenge that calls for innovation and imagination. Panasonic technologies made images screened through semi-liquid surfaces impressively clear and realistic. 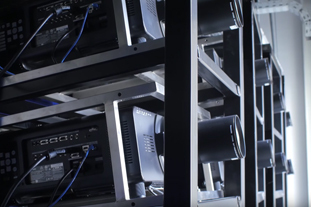 Rows of precisely aligned PT-DZ21K2s brought mapped visuals to life. The Dubai Festival City show rivals other popular waterfront shows worldwide. A total of 12 quad-lamp PT-DZ21K2s were used across six water-screens, the largest of which measuring 68 meters wide by 13 meters high for a record-setting surface area of 893 m2. At the water screen launch event, the projectors streamed 360-degree multimedia visuals in tandem with live-performance elements themed “Fire. Water. Light. Awe.” Dancers and acrobats were projected onto hotel walls in crisp 3D by 60 units delivering 20,000 lumens of brightness from a maximum distance of 320 meters. DFC and Laservision, together with Panasonic, selected the 3-Chip DLP™ PT-DZ21K2 quad-lamp projector—a model delivering 20,000 lumens of brightness—for its outstanding imaging prowess, long-term reliability, and high efficiency. It’s also universally compatible with professional sound systems and LED Lighting. Sharp, high-quality image makes the projector perfect for large-scale events. The technology behind the PT-DZ21K2 projector was proven in 2015 and 2016 at Moscow International Festival “Circle of Light”. 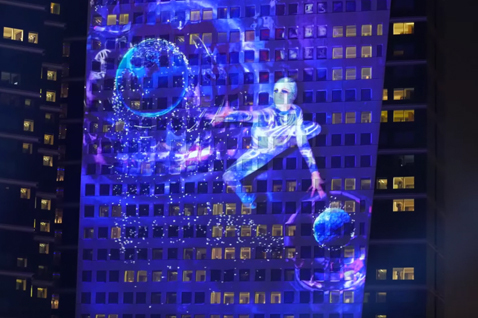 During the 2016 festival, a 50,458 square-meter multi-screen image projection set the Guinness World Record for Largest Temporary Projection Mapping. During the Olympic Games Rio 2016, more than 110 Panasonic PT-DZ21K2 projectors helped facilitate high-quality visuals throughout the Opening Ceremony. Panasonic visual systems have been closely associated with the Olympic Games and other major global events for decades. 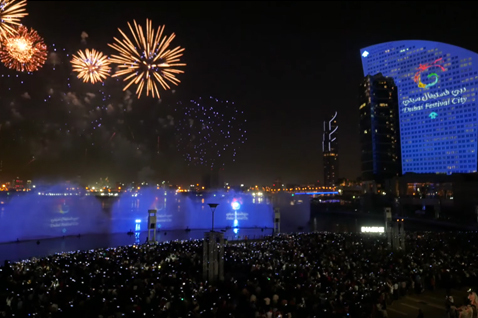 The projection system at Dubai Festival City remains in daily use with full capabilities unleashed when events are staged within the precinct.